Disclaimer: I blame the late hour for the atrocious state of my kitchen. Kids, don’t do this at home. I had to make something substantial for breakfast. Buying bagels just wouldn’t cut it. 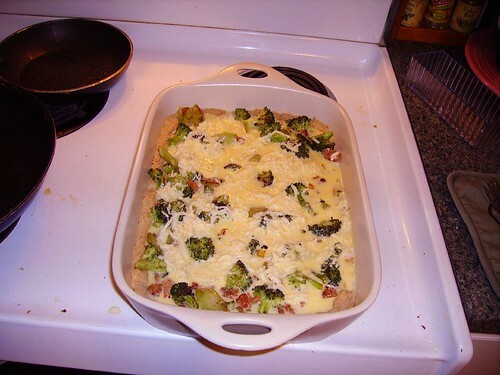 Besides, I had all the ingredients already — eggs were on two-for-one sale at Harris Teeter the other day, there were some veggie-like staples around and some sausage in the freezer, and a pie crust would not be that big of a deal, even at midnight. 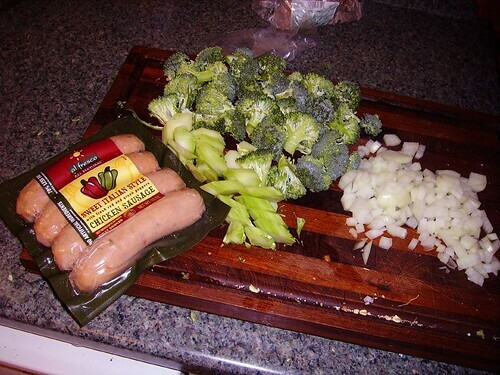 So while I let the sausage defrost, I kept myself busy by dicing an onion and choppin’ broccoli. I also started the oven preheating to 375 degrees on the Fahrenheit scale. A few notes: First, notice that I used the stem of the broccoli. A lot of people throw out their broccoli stems. This is a bloody shame–it’s the tastiest part of the broccoli if you know how to treat it. Simply cut off the woody outer layer (about 1/8 inch all around) and cut the broccoli stalk into thinnish slices (a little under 1/4 inch thick). It will cook through with the florets without much of a problem, and it tastes outstanding. Second: The sausage I’m using here is Al Fresco “All Natural” Chicken Sausage–in this case, the “Sweet Italian Style with Roasted Red and Green Peppers” variety. It’s precooked and it’s not too bad. It’s extremely low-fat, which can be something of a liability in a dish that depends on sausage to do its voodo, but we can work around that. Also, despite being a chicken sausage, it uses a natural lamb casing. Yay, natural products, but unfortunately this makes it non-mammal-safe, which might bother some of the folks in the market for a chicken sausage in the first place. Basically what I do is squeeze the frozen bits of fat between my thumb and forefinger until they smoosh out into a flat little pancake, then break up the little pancakes until they are mostly integrated into the flour. Once it got to the consistency shown above, I started adding ice water a tablespoon at a time and mixing, until the dough would just come together when given a good squeeze. 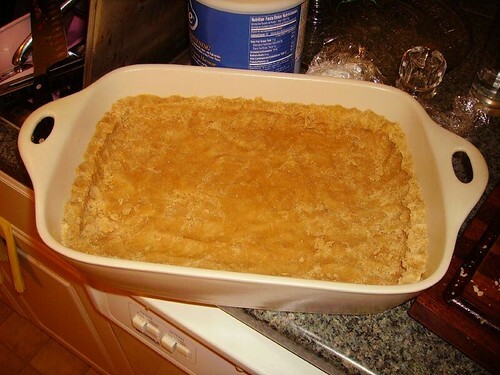 (If, during any stage of this process, the butter/shortening starts getting too soft, just stick the dough into the freezer for a few minutes and it’ll stiffen up the fat, which is important for a good, flaky crust). Once the dough came together I stuck it in the fridge for half an hour so that the dough would hydrate. This is important. Do not omit this step. 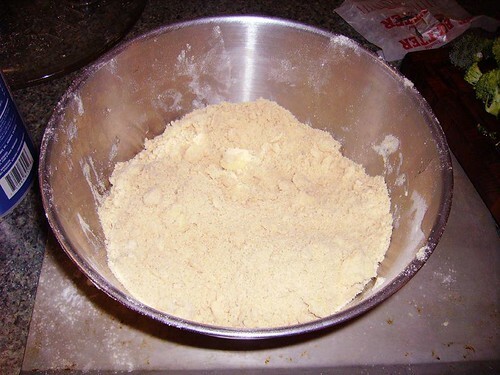 This will stop your dough from being a crumbly mess and allow it to actually act like a dough. Truth to tell, I probably skimped on the chilling–my dough was a little crumbly. Because of this, I ended up just pushing the dough into shape in the bottom of the baking pan I was using rather than rolling it out or anything. I think part of the reason for my crumbliness might have been (once again) my use of white wheat flour (see our entry on grilled pizza for more info on this ingredient). Proper gluten development is important for pie dough texture, and the ratios are all off with this new kind of flour–maybe I should try some vital wheat gluten. If anyone has suggestions on working with white wheat flour, please leave a comment. 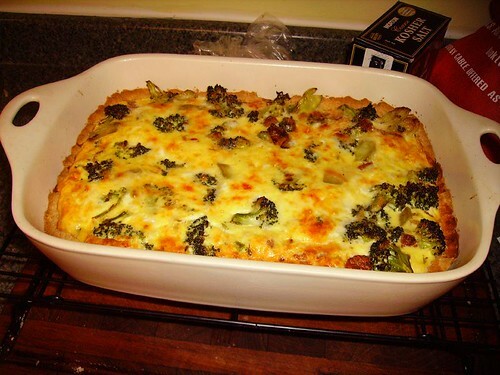 Once the quiche shell was prepared, I blind-baked it for about fifteen or eighteen minutes. Blind baking — baking the crust by itself prior to the “real” baking session — is very important when you’re working with a pie shell that’s going to be under a lot of wet ingredients. It helps ensure that the crust will bake all the way through and do its flaky-tender thing despite the weight and moisture of the ingredients resting in it. Usually I blind-bake a pie crust for about ten minutes, but this shell was definitely thicker than it would have been had I rolled it out. Also, I was working with a serious piece of stoneware rather than a pie pan, so I had some serious specific heat to overcome. All throughout the travails of pie-crusting, and while the crust was blind-baking, I had also been cooking the filling ingredients. 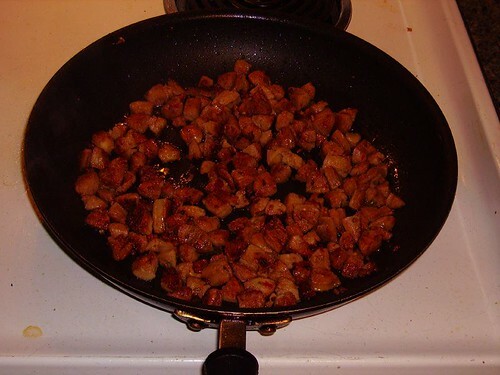 Even though the it was fully cooked, I sautéed the pallid chicken sausage in some olive oil in the hopes of giving it some color (“giving color to something” is chef-speak for “getting it all brown and nummy-looking”) and putting some of the sausage flavor into the oil. Also notice that the sausage is chopped here. Normally I would remove sausage from its casing and break it up like ground beef, but since this sausage was precooked it had a pretty good hold on its casing and wouldn’t submit to being squeezed out of it. Once the sausage was sufficiently crispy looking and delicious, I took it out with a slotted spoon and sautéed the onion in the remaining oil. Once the onion was done, I cooked the broccoli in the same pan, starting with a sauté and finishing it by steaming it under a lid until it was tender. Then I set everything aside until the crust was done. After the shell had blind baked, it had definitely dried out and puffed up a little, and was looking pretty flaky. I knew it wouldn’t be my best pie crust ever, but I was satisfied considering the hour (it must have been 12:30 by this point. Quiche doesn’t usually take this long…). 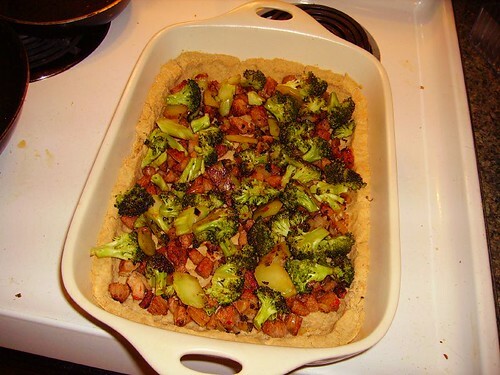 Anyway, now that the crust was done, I put the fillings in, in approximately the order “onion, then sausage, then broccoli”, but from the looks of things, it didn’t really make that much of a difference. I then poured in a quiche filling I had prepared, which consisted of approximately this: one dozen eggs, one cup of half-and-half, eight ounces of shredded Italian cheeses, salt, and pepper, whisked together thoroughly. < Previous (Bad) Technique: Misadventures in saucing! I would not have guessed that making crust would have involved such preparation, not being a baker, myself. I loves me some quiche, though. Perhaps I’ll take a shot. I’m loving the blow-by-blow accounts of cookery. I’m of the “throw stuff into the pot, season to taste” school of cuisine, myself. You’re encouraging me to want to branch out into trickier things. Crust is a tricky beast. It requires the power to tame temperamental and temperature-sensitive cooking fats. I still haven’t mastered it (though I think I make an okay pie crust when I’m not using whole wheat flour). Glad you’re enjoying the pedantry of my blog! If you want to practice patience and proper technique, try making a risotto. It’s not hard, but you need to follow directions to make it work well. That looks really tasty, but crust is too much work for me. Yay frittatas! Also, I agree wholeheartedly about the broccoli. The florettes are boring, but get all of the glory. The stem is way better, and raw it’s downright zesty. I’d so much rather eat raw broccoli stems than raw florets. I find raw florets to be practically inedible, but the stem is deliciously sweet and spicy. The stem is definitely where broccoli betrays its relationship to mustard. The other thing I love to do with broccoli is to dredge it in egg and flour, sauté it in some ripping hot oil, toss in some ginger and garlic and finish with soy sauce and toasted sesame oil. 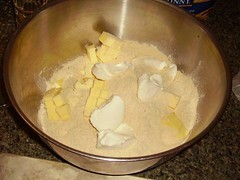 Scramble the rest of the dredging egg, combine, serve over rice. Yum! Yum. I love quiche. I wish I had an oven so I could make one right now (it’s 1:25 am). Is that a function of being in the Philippines or being about to move? How do you survive?